When an annuity sale seems imminent, many agents make 2, 3, 4 – even 5 phone calls to brokerage houses and/or insurance companies. 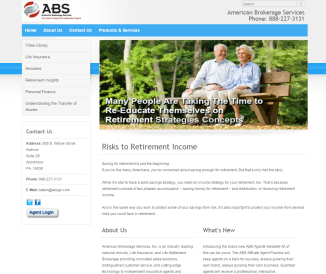 ABS agents make only one phone call! At ABS, we recognize that efficiently transacted business leads to profitable results. In this respect, we are pleased to provide you with a central point of access to our product/company information, sales tools, and case management resources! We have developed a Turn-Key system, that will help you get in front of your business-owner clients and help them do two things that matter most. The ABS AGENT WEBSITE will keep agents on a track for success, always growing their own brand, always growing their own business. Qualified agents will receive a professional, interactive, customized web site, and more. Your brand will be on display for all your clients and prospects to see.